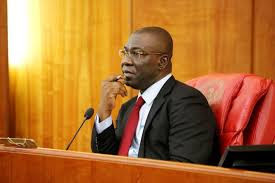 The Deputy President of the Senate, Senator Ike Ekweremadu, has raised the alarm over the escalating killings and insecurity in Nigeria, warning that more lives would be clost unless the nation’s security architecture was reorganised. Reacting to the recent killings in Plateau State, which had left scores dead, Ekweremadu decried the reluctance of the nation’s leaders to tinker with the nation’s security structure, despite glaring lapses. The Senator, who spoke after decorating his newly promoted security aides, Mr. Uchenna Igwebuike and Edward Utuh, with their new ranks of Superintendent of Police (SP) and Assistant Superintendent of Police (ASP), respectively, however, commended the Nigeria Police for the recent promotion exercise, noting that such would motivate the personnel to give their best. On the recent killings in Jos, Ekweremadu said: “It is really unfortunate because our country is a nation where the leaders have refused to learn from the mistakes and missteps of the past. “For many years now, some of us have been consistent about the need to descentralise our security architecture; and so long as we are not doing that, we are going to get exactly the same result. “The sad news is not only that many people have died, but also that more people will die unless we take the right steps, putting the right security architecture in place. There is no way you will have a federation like Nigeria as big as it is, with all the diversities, and continue to operate a centralised policing and expect it to work. It will never work and it is a major problem. “So, it is sad that this is happening. But, as I said, the real tragedy is that this Plateau incident is not going to be last because we refuse to be corrected”. Ekweremadu reasoned that the Government of Plateau State would be in the best position to protect the citizens if it had its own police outfit. “I want to call on the Federal Government and the leaders of this country again for us to, for once, decide to protect the lives and property of those we are leading because that is the primary purpose of government. I appeal to the Federal Government to have a rethink on the issue of restructuring, especially the ones relevant to the security of lives and property. And the only way to do that is for all of us to sit down and agree to, within a space of the next two or three months, amend the constitution to enable the component units of this country to have their own security architecture, namely the police. “If the people of Plateau are empowered under the constitution to have their police, then you can place the blame squarely on the governor because he will have the responsibility to recruit sufficient police personnel to protect the people. Right now, the responsibility is that of the Federal Government. There is little or nothing the governor can do about it. “I sympathise with the people of Plateau State, especially the communities, which lost their loved ones. However, I will continue to sound even like a broken record until the correct thing is done”, he concluded.